Even in 2018, organizations around the world are susceptible to fraud. A 2016 study by the ACFE (Association of Certified Fraud Examiners) found that “the typical organization loses 5% of revenues in a given year as a result of fraud.” For healthcare providers (HCPs), however, this problem can be especially challenging to solve because they have so many other regulations, like the Sunshine Act, to comply with. That’s where an automated solution can come in handy. 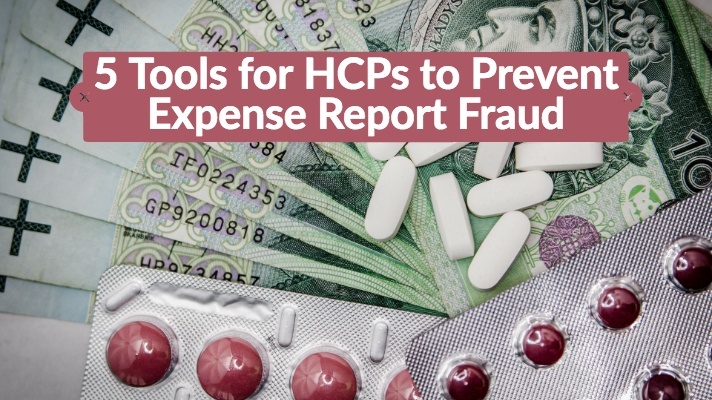 Here are the top 5 tools HCPs can use to battle expense report fraud. Over-reimbursement for mileage is a particularly challenging kind of fraud to combat. Employees might have good intentions and they’re doing some estimation rather than trying to be malicious. The end result is that they may over-estimate by 2 or 3 miles for every trip, which can add up to hundreds of thousands in lost cash. The solution is highly accurate mileage calculation that prevents estimation. Using Google Maps, employees type in their originating address and their destination address (and any stops in between) and the system calculates the exact number of miles and puts it on the employee’s expense report. The software can also calculate commute mileage so that companies aren’t accidentally reimbursing for an employee’s regular commute to their regular work location. This might be another kind of accidental fraud, but duplicate submissions of a single expense can also be purposeful. Using this method, employees will submit the same expense two or more times in order to get double the reimbursement. They might do this because they forgot that they already submitted it, but the end result is that they get extra reimbursement in the end. The answer is automated software with an auditing tool capable of fishing out duplicate expenses. The system can come up with a list of exact matches and their associated receipts for auditors to easily examine whether the expense has been doubly reimbursed. With a company credit card in hand, employees might be tempted to use it here or there for small expenses. Then, the company automatically pays for it. With credit card feeds integrated directly into employee expense reports, employees have to account for every expense and provide a receipt. The best part is that the process is made simple because all the data from the credit card feed gets pulled into their expense report, making it a matter of attaching a receipt or taking a picture of a receipt and submitting the report. This also discourages unintended use because all the information surrounding the expense is captured and employees know that they need to account for those expenses. Some employees will commit expense report fraud because they know that their approver is overwhelmed with other tasks and doesn’t have the time or patience to go through every expense for every employee. They’ll use this knowledge to sneak in expenses and seek reimbursement. Automated compliance with multiple approval levels takes the workload off of one approver or manager and distributes it. The expense report is seen by multiple pairs of eyes and has a better chance of spotting problems or potential fraud. Plus, approvers can also be reassured that the system is automatically denying expense reports with obvious problems, leaving them to work more closely with those system-approved reports. If something gets missed at the approver level, auditing & reporting are an excellent step for catching fraud. The audit will provide you with valuable data based on your concerns. For example, you might run an audit to uncover who most frequently fails their first expense report submission. Or, you might want to look for who fails against a particular policy. This data can help you figure out who might need more training or who might need extra scrutiny when they submit their expense reports. With these tools, you can uncover more fraud and keep more of your organization’s money in your own pocket. Don’t be one of those organizations losing 5% or more of their yearly revenues due to fraud. Taking the sensible precaution of implementing automated expense report software will go a long way to help HCP organizations prevent fraud. DATABASICS provides cloud-based, next generation Expense Reporting, P-Card Management, Timesheet Management, Leave Management, and Invoice Processing automation. Specializing in meeting the most rigorous requirements, DATABASICS offers the highest level of service to its customers around the world. DATABASICS is relied upon by leading organizations representing all the major sectors of the global economy: financial services, healthcare, manufacturing, research, retail, engineering, nonprofits/NGOs, technology, federal contractors, and other sectors. Connect with DATABASICS: LinkedIn, Twitter, and YouTube. DATABASICS is headquartered in Reston, VA.